Every once in a while we do something a little out of the ordinary compared to our typical Disney vacations for a variety of reasons. On our last trip to the parks, we decided to re-visist a hotel we'd stayed at a few times many years ago, long before this site was a reality. First and foremost, notice how I don't call this particular property a resort, but rather a hotel. The DoubleTree Suites in the Disney Springs Resort area isn't really designed to be anything more than a hotel "plus." It's not a sprawling resort with a grand theme or amazing pools like you may find at a Disney resort or even neighboring Waldorf Astoria, Marriott, and even other Hilton owned properties (the parent company of the Double Tree). However, while it does lack a certain resort quality it functions largely as what I called a hotel "plus" above. It's not a Hilton Garden type hotel designed for short stays and simply a nice clean place to stay, but rather it shares a lot of qualities of that resort style draw. The Double Tree offers an above average pool (nothing super special but it works), a great location, large rooms, and an extremely friendly staff. If I had to describe it in a sentence, it is the resort I check when I want to book a budget friendly vacation when even the value tier resorts on property are a bit more than we're interested in paying. Dont get me wrong, I am and always will be a firm proponent of guests staying on property and do so almost exclusively myself. However, if your dates are at just the right time and you want a little extra space compared to a value resort run by Disney this is and has always been our go to pick. If you catch it on the right dates, the prices can be incredibly low and on our most recent stay we spent less than $700 for a four night stay. Couple that with the Hilton Honors points we had saved up from other non-Disney vacations and using the Hilton Honors card itself and our costs continued to drop below that original number. It's not the ideal Disney accommodation but it's far better than hundreds of other options in the Orlando area. This single factor alone is one of the very best aspects of this resort. Disney does not own the resort, but the resort is technically still within "Disney Property" and sits less than 2 miles from Disney Springs. An Uber ride will cost you about $5 to ride to Disney Springs but you can easily make the walk at night in around 15 minutes. It's a tough walk in the heat of the day in the summer but there's a second added benefit of being "on property" while still being "off property" in a elative sense. 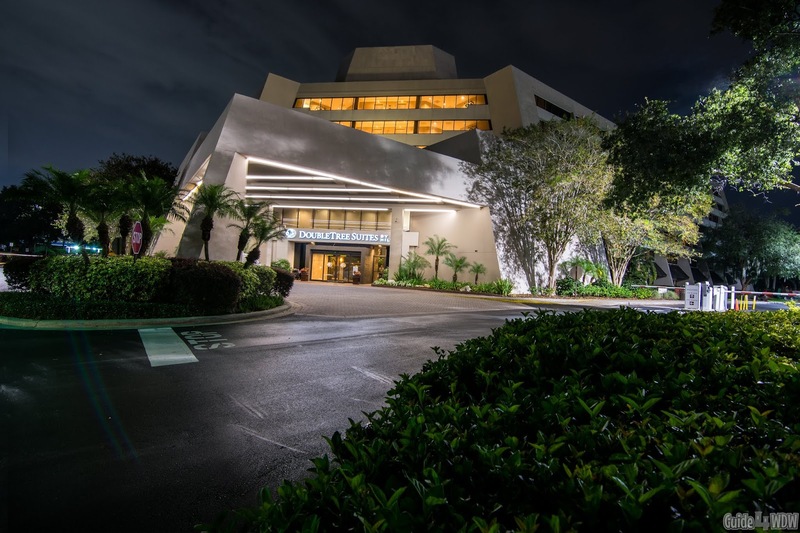 Due to its location and relationship with Disney the Double Tree, along with other properties in the vicinity, fall into with Disney terms Good Neighbor hotels. The title they give these resorts is a little misleading, but functions similarly to how the Anaheim Disneyland resort refers to hotels. As a perk of staying in one of these select hotels, you get the added benefit of 60 day fastpass+ booking and extra magic hours (you pick up cards for extra magic hour verification purposes at the front desk). The downside is the transportation. The resort does provide transportation to the parks, but it is not run by Disney and as a result the transportation is pretty lack luster. So much so that we opted for Uber and Lyft to get us from place to place instead. We've attempted to use the transportation in the past, but it was not the best scenario. The buses tend to be extremely crowded, run fairly inconsistently, and service multiple resorts before heading to the final destination. In all honesty this was and is the biggest downside to this resort for a variety of reasons, but something worth noting for anyone planning to use the buses as their sole source of transportation. An additional strongpoint and real strength of this particular property is the cost. Inevitably if you're a Hilton Honors member or staying on a discounted rate, you can save some money staying here if you're careful about transportation costs and parking fees. If you're driving, you're almost better off staying on property because the nightly parking fee is $22 per night. Plus, if you opt for using your own transportation you will still have to pay parking fees at the parks on top of that unless you're an annual passholder (assuming you don'y fly in and use a service like Uber or Lyft - here are our thoughts on that). If you plan your stay carefully, you can save a little money when comparing accommodation prices to those found on property. When you add in the greater room size, even in standard suite rooms, the benefits can occasionally outweigh some of the downsides of not being in a Disney owned and operated resort. You are going to lose a certain element of being in that "Disney bubble" and to me that's a huge part of the Disney experience overall for many first time and returning Disney guests. It's not something I can fault the Double Tree for but there's just an added piece to the vacation puzzle when you can see and do everything you want without the worries of any transportation concerns or hidden costs during your stay. When Disney provides everything it's just "easy" and a adds a little something to the feel of your vacation. A standard room at this particular DoubleTree property isn't entirely standard. The hotel features suites offering guests a living area and a separate room with either two queen beds or 1 king bed separated by a sliding door. Additionally, each room comes with a miniature refrigerator, a small sink in the living room style area, and a fairly good size table. The extra space in the room is a huge bonus for those with larger families or who just want a little extra space without having to pay the Deluxe Villa price of similar Disney accommodations. Sure, there are sacrifices when staying off property and I talk about them heavily in our Disney World Budget Tips - How to Plan a Budget Friendly Disney Vacation article. I even went as far as to recommend not staying off property if you can absolutely avoid it. While that may be seemingly contradictory, at the same time if you're not an Annual Passholder or coming to the parks multiple times during the year like some guests are, I still don't recommend staying off property. If you are like us and headed to the parks multiple times throughout the same year, it can be a good option, but if you're a first time guest or planning your one big vacation for the year just stay on property. I don't say that in any way to discredit the great value you can find at the Double Tree (it truly is a great hotel), but it's all about convenience and making the absolute most of every minute of time you have with friends and family. Breakfast tends to be a big benefit here if you are a Hilton Honors card holder. If you are not a card holder, you can buy a breakfast package to get a really good breakfast for each day of your stay added to the cost of your room. As a Hilton Honors card holder you are automatically given a a breakfast for each guest in your party each night of your stay depending on your cardholder status. The complimentary offering is pretty good but you can upgrade your breakfast to include bacon, sausage, omelettes, and a few other add ons for $5 per guest. Truthfully, it's a really poor system and one that I literally saw two different guests get irritated with the front desk about upon check in. $5 obviously isn't the end of the world for a great breakfast with a ton of offerings but if you're Hilton I don't see why you'd try to pull $5 more dollars out of your guests pockets and risk them being irritated about it as soon as they check in. Sure, it makes financial sense but if you read any reviews on Trip Advisor or other online sites that's the number one thing guests complain about. With all of that being said, it's not really a complaint I had with our stay. We gladly payed the $5 a couple days of our trip to start the day off right with a good breakfast and the staff at the dining location is exceptional. It's the same group of servers that have been there for years (select servers literally 20+ years) and they treat you like part of the family. Many guests know them by name from repeat visits to the property and the servers know them just as well. Long story made short, this is and always likely will be a great place to stay if the rates are cheap or at least more budget friendly than Disney resorts. However, its not going to be an ideal solution for so many different reasons. Would I stay here again, absolutely. Would I rather stay on Disney property? Without a doubt. Not everyone is like me though and some prefer a classic hotel style accommodation over a heavily themed experience for any number of different reasons. The Double Tree is a great hotel and an even better location. It's far better than other non-Disney resorts in the area and the added advantage of being in the Disney Springs resort area makes it a far better option than so many other resorts that are truly "off-property" a and down the road from Disney. If you're booking a trip, it's certainly worth a look. If you want to do some comparisons completely free of charge, let our friends over at Destinations to Travel help you out in the booking process. It really helps us out when you book through them!